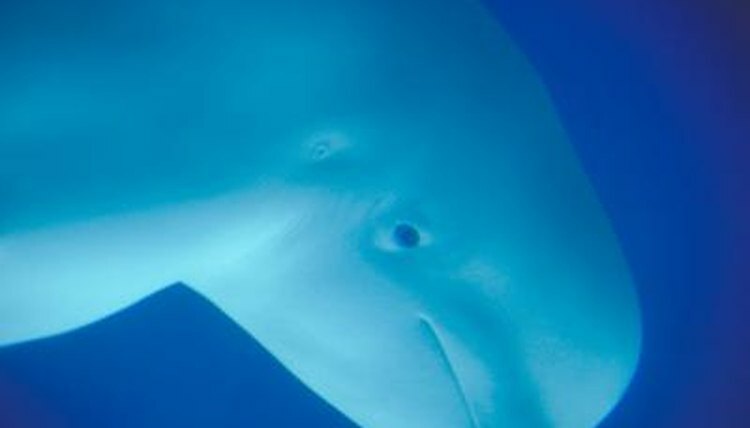 The beluga whale is distinct from other whales, particularly in coloring, size and choice of habitat. White, relatively small and demonstrating a notable preference for icy environments, the beluga is one of the more easily identifiable types of whale. The habitat he lives in and the company he keeps set him apart just as much as his large forehead and his trademark hue. Beluga whales live exclusively in arctic and subarctic environments, though they are more commonly found in the former. Generally, they prefer shallow waters, staying close to the coast. While they are well-adapted to the cold and can live in waters as cold as 32 degrees Fahrenheit, they also swim into warmer areas, including large rivers in Russia and Canada. Belugas are highly social creatures, so whatever habitat these whales enjoy, they have friends to share it with. A group of beluga whales, called a pod, can be as few as 10 or as many as several hundred. The animals have highly developed senses of hearing, and communicate with each other using whistles, clicks, squeals and other sounds that make up their language. Beluga whales aren't confined to a single habitat -- they migrate in groups to escape particularly inclement weather conditions. While they are conditioned to thrive in cold waters, as summer ends and their arctic habitat begins freezing over, they must migrate south toward relatively warmer climates like the Canadian coast. If they fail to migrate in time, they can become trapped in newly formed ice and die. As short as 13 feet long, the beluga is considerably smaller than many other types of whale, and consequently not as well-equipped for self-defense. Their predators in their natural habitat include polar bears and killer whales. They are also hunted by humans for food and for their thick skin. Because of these threats, beluga whales are classified as a threatened species.